Mark Kelly believes Pompey had enough chances to beat Andover New Street after his side crashed out of the Hampshire Senior Cup. The Blues outfit, made up of academy players, fell to a 2-1 second-round defeat at Foxcotte Park. Despite Alfie Stanley giving the visitors a second-minute lead, goals either side of half-time from Shane Lock and Callum Sweeney dumped Pompey out of the competition. Kelly felt the Wessex League premier division basement side put their physical advantage to good use. But he reckons his troops had enough opportunities to win the tie as the Blues marked their 31-year return to the county cup with a loss. Kelly said: ‘I am disappointed. Technically we were all right and used the ball well but we weren’t physical. ‘This is why we came to play these games – it is what it is. At the right times we should have scored goals and we didn’t. ‘Physically they started to think they were in the game, throw everything at it and got the result in the end. ‘We have got to learn from it. We had enough chances in the game. ‘Their goalkeeper has pulled off one or two good saves but we have missed three-yard chances and six-yard chances. Over the course of a game that hurts you. ‘As for the physicality, it was a big lesson for them. ‘Technically we should have shifted the ball a lot quicker, got it moving around and got them moving. ‘They obviously sat back, thought they were in the game and we made a silly mistake for the second goal – it leaves you on the back foot. 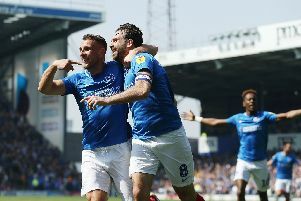 Kelly was encouraged by the start Pompey made through Stanley’s early opener. But he was disappointed how the early impetus his side gained slowly ebbed away. Kelly added: ‘It started so well because technically they were doing it right, moving the ball in the right areas and shifting it.